I woke up at the usual 8am, bleary eyed yet fully awake. There’s something about this day though, that makes me just want to stay at home and curl up in bed with my book. But I reasoned it’s the day before my last day, and I should make the most of my holiday. So I forced myself to go out, having lunch at Compass Point, then riding the MRT all the way to Harbourfront. Vivo City is still pretty much the same as it was two years ago. It’s still huge, and the shops I’ve visited before were still there. 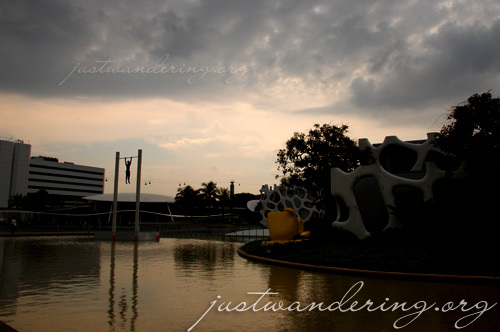 My favorite spot in Vivo City is the open spaces fronting the water. Since it was a weekday, the place wasn’t as crowded. It would be the best time to just sit around, look out to the water and read a book, but I just wasn’t in the mood. Instead of riding the train back, I switched to the East-West line for Bugis. I wanted to check out the shops at Bugis street, then maybe the National Library, and the Museum of Toys. 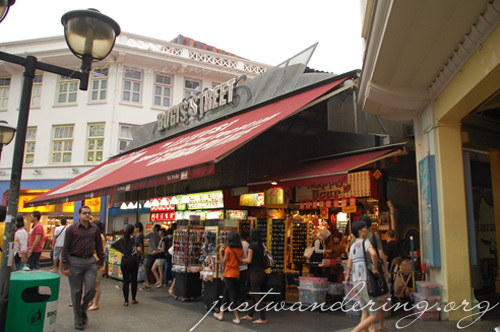 I only made it to Bugis street, and didn’t even bother checking out all the stores. I did walk away with a bag full of chocolates though. I walked down North Bridge Road, passing the library, but not stopping to check inside. I figured I can just do that for another day. The sky was turning dark and I wanted to be inside the bus before it rains. I made it to the bus stop just in time for my express bus home. Dreary days are dreary indeed. I guess I just want to take it easy and rest before work starts on Wednesday. Today wasn’t totally depressing though. 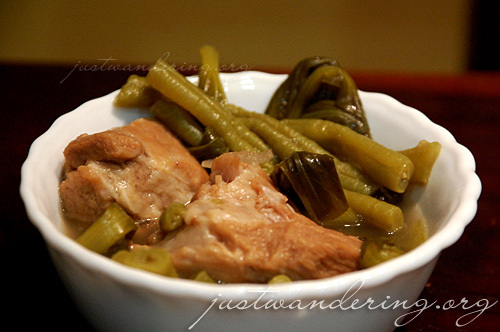 Waiting for me at home was a nice hot bowl of sinigang na baboy (pork in sour broth). Tender meat, lots of veggies and very sour soup, it was a nice end to an otherwise unremarkable day.